VETERANS MIDDLE SCHOOL – Veterans Middle School students from Mr. Juan Andrade’s Career and Technology class participated in HESTEC’s 10th year of promoting science, technology, engineering and mathematics (STEM) education at the University of Texas Pan American on September 29, 2011. 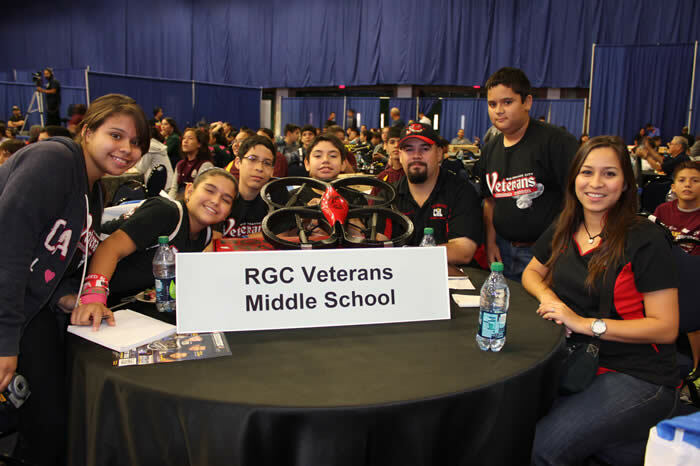 The VMS team consisted of five students who competed in HESTEC’s Robotics Day Flight Competition. The team’s objective was to learn how to fly and communicate with an AR Drone (remote controlled helicopter) through an obstacle course in the fastest time possible for the most points. Veterans Middle School is extremely proud of their VMS team who placed 10th out of 51 middle schools from throughout the Rio Grande Valley at this year’s competition. Congratulations to the VMS team and their sponsors. Pictured above are VMS students who participated and their sponsors: Ali Garcia, Noel Garcia, Roxanne Garcia, Mario Lopez, Gabrielle Pena and Mr. Juan Andrade (VMS Career and Technology Teacher) and Savannah Lopez (VMS Teacher).